What a momentous month this has been, Charlie! It definitely feels different than all the last. Throughout your first seven months, your development was slow and steady; each time I sat down to write another monthly update I would reflect on how quickly time was passing, in awe of how you had somehow managed to age another month without my noticing. But this month is nothing like that. 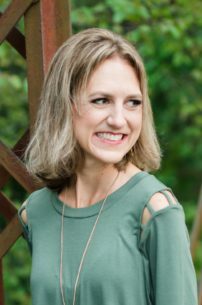 As I write this monthly letter, I’m looking back at how much growing up you’ve done in the past four weeks and wondering how you are ONLY one month older! We’ve seen quite a few physical changes in you this month: you’ve grown, of course, and you are spitting up and drooling a lot less. 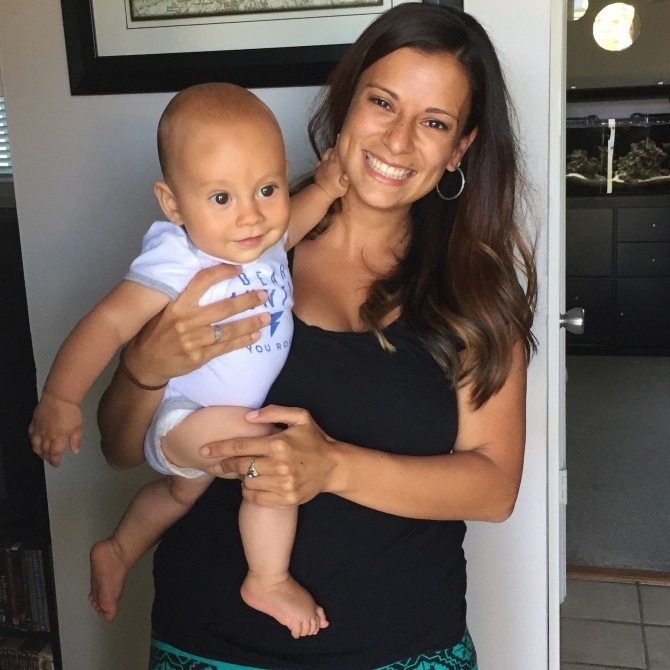 Another significant change has been a tremendous increase in your vocal abilities: you’ve become our little chatterbox, babbling throughout the day (especially when you hear Mom’s audiobooks in the background). Sometimes you squeal with delight, and you “scream” when you’re startled or upset. You’ll often let out little sighs when you are bored and just before you drift off to sleep. You also like to have conversations with yourself in the mirror, which couldn’t be any cuter! 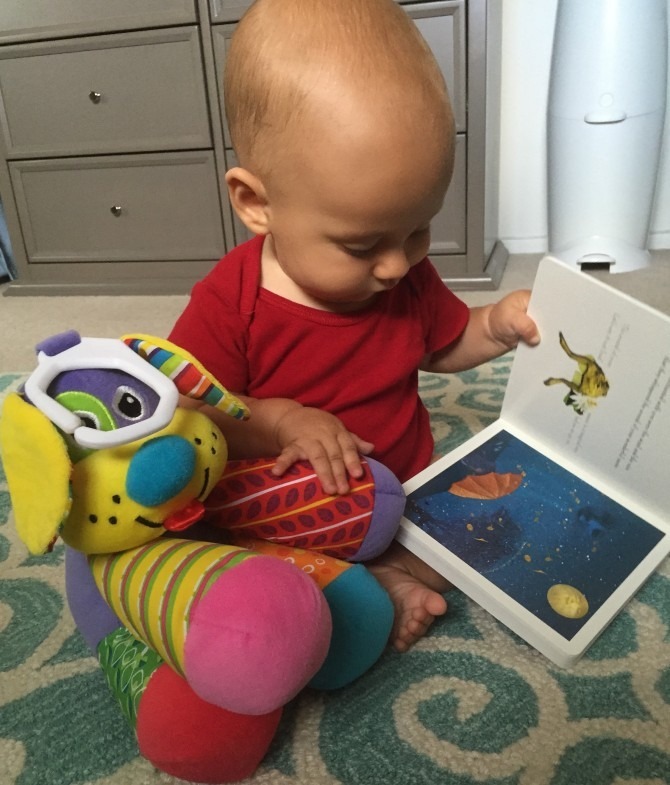 Your most pivotal development is a physical one: it was right around the 7-month mark when you started sitting up independently. You went from sitting for just a few seconds at a time to suddenly sitting all on your own for minutes on end. You take your sitting up very seriously and it’s funny to watch your furrowed brow and erect back as you focus on staying upright. You haven’t fully mastered the skill yet: you still can’t get to a seated position on your own, and you fall over sometimes when you get distracted or intrigued by something and try to lunge for it! You seem totally unfazed by these tipping incidents, and it’s kind of cute to see you topple! Your sitting up was a catalyst for whole slew of new changes: you can sit in your high chair at home and at restaurants when we go out to eat; you’re able to ride in the cart at the grocery store (though you really don’t like it, so I’m continuing to wear you in a wrap when we shop); and you now get to ride in your stroller without the car seat, which has led to your newfound love of our stroller walks. You still prefer being worn on walks, but it’s been too hot to wrap you, so we’ve been using the stroller more often. 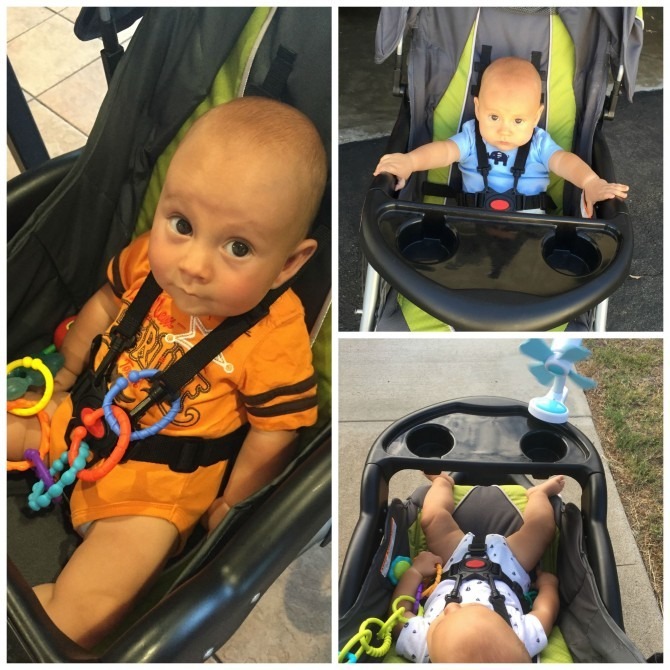 We got you a fan that attaches to your stroller tray: you get completely mesmerized by watching it spin, and you’re quite the hit with passersby who envy your fancy get-up! Play time has obviously changed quite a bit too, now that you’re sitting. You continue to like hanging out in your swing (thank goodness you still fit!) 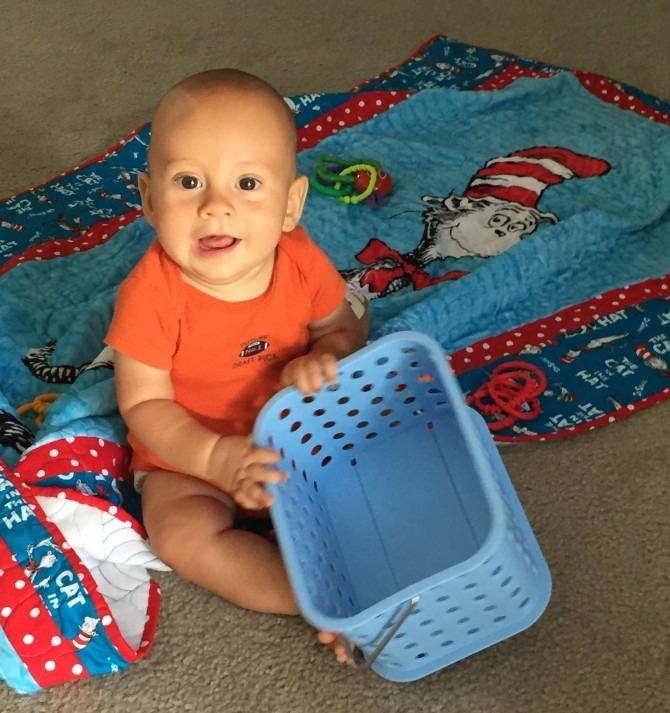 but we’ve graduated from the Bumbo and the play mat (sniff). 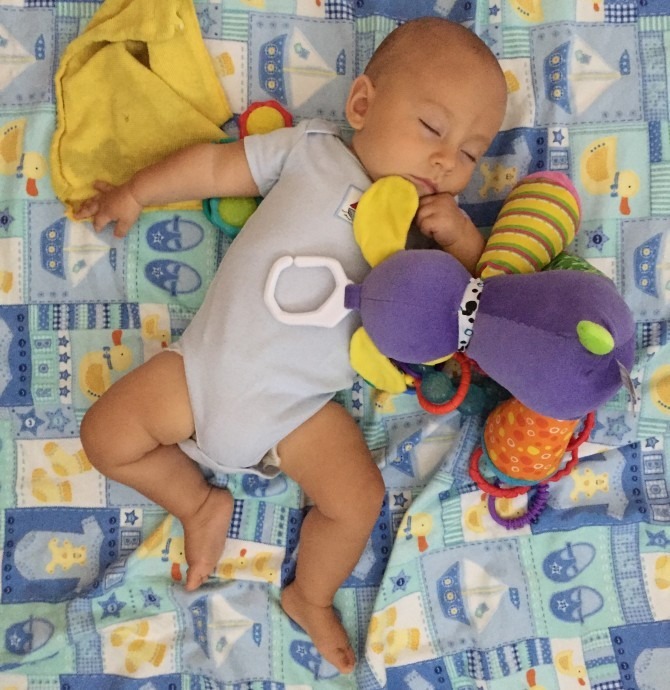 You’re less smitten with your beloved rattles and now like more interactive toys, like balls and colored links that you can sort and stack. You can’t get enough of games like peek-a-boo, tickle fights, flying in the air with Daddy, or dancing with Mommy. And while you prefer when we play with you, you will occupy yourself with independent play for 20-minute intervals. We have to keep a close eye on you, though, because even though you aren’t officially crawling, you are definitely mobile: you roll your way around the room to get where you want to go, and in the past week you’ve started using your legs to propel yourself forward. I’m expecting to see some army crawling any day now! You really love being held and will frequently lift your arms above your head to be picked up. You aren’t at all picky about who is holding you; even though I not-so-secretly wish you were more of a Mama’s Boy, we’re thankful that you are happy to be passed around to friends and extended family members. Two weeks ago your daddy and I went on our first date night since you were born. In the past, we’ve left you with your your Opa and Oma for short periods during the daytime, but this was your first evening home without us. Your Tía Amanda watched you and it sounds like you did great: she let you watch your first movie (The Aristocats) which I’m sure elevated her to Favorite Aunt status because you LOVE screens but we don’t usually let you watch TV! It’s funny to see the things that capture your attention: right now, you are in love with water—you enjoy splashing around during bath time and you are entranced by water fountains. You have only been swimming a couple of times, but you really seemed to like it, and you would drink water out of a straw all day long if we let you. You also have some very distinct feelings about animals. 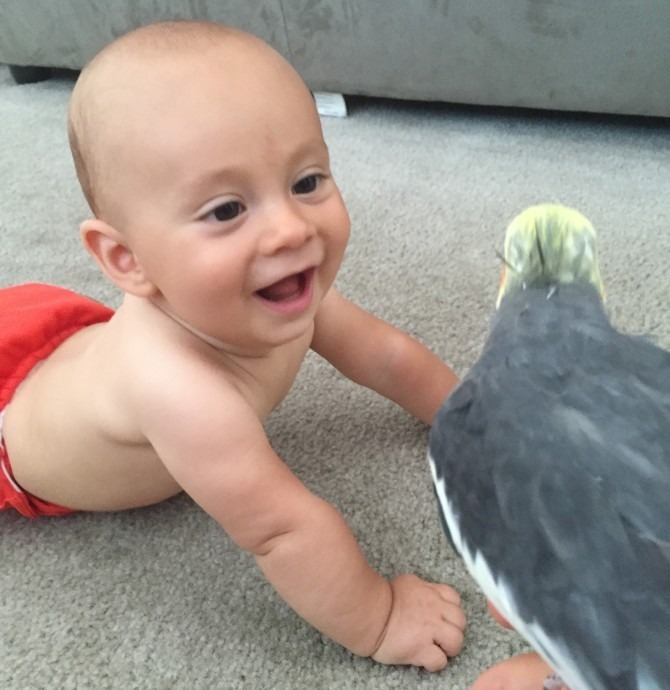 You are absolutely enamored with our Sunnybird and love to watch him in his cage. When I take Sunny out to play, you giggle and are determined to try to grab at him. I wish your love of birds transferred to all animals, but unfortunately you do NOT like dogs. You find your Grandma and Grandpa’s German Shepherds particularly frightening, and I’ve never seen you react the way you do around them, shaking and clinging to us whenever they come near. I certainly hope this is a phase because we really want to get our little Charlie Brown a pet Snoopy one day! I’ve enjoyed watching more of your personality emerge this month. You are playful, spunky, and incredibly curious, always wanting to know what’s going on around you. You have your calm moments, but you are are stubborn and get very upset—very quickly—when something doesn’t go your way. When it comes to new places and objects, you are sensitive and cautious. I have a feeling you are a “highly sensitive person” (don’t worry, you’re in good company. We’ll get through it together, Buddy Bear.) You’re still our serious little guy, but as long as you’re in a good mood, it’s not too hard to get you to smile or laugh. When we’re in public I’ll often see a smile pass across your face, a sure sign that a stranger is making eyes at you—you are quite the lady’s man! Those smiles have been a bit less frequent in the past couple of weeks, though. The culprit: two little teeth that are poking through your bottom gums! 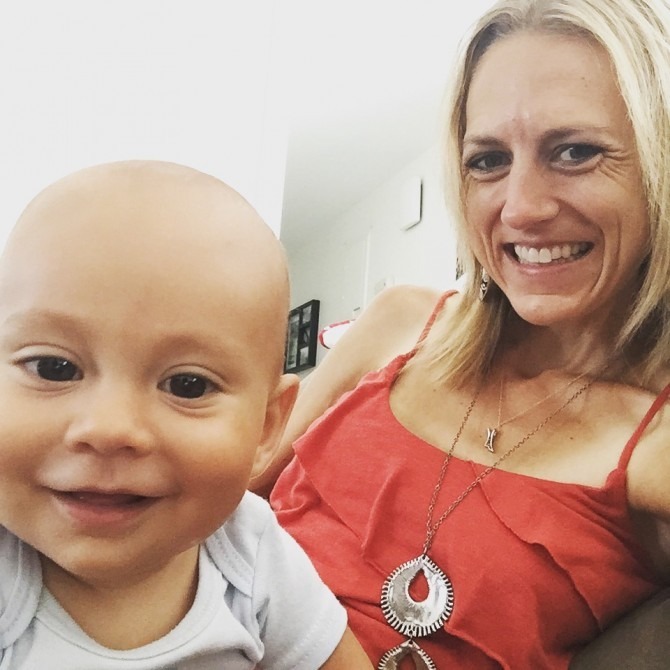 You seem to be having a really hard time with teething, and it’s made for some very long and tearful days and nights for our entire household! Speaking of sleepless nights. . . we’ve certainly had our share this month! You’ve never been a great sleeper, but lately you seem to have boycotted sleep altogether. I find myself wishing for the “good old days” when you would at least sleep for a 4-hour stretch when we first put you down at night; these days it’s nearly impossible to GET you to sleep, and even when you do drift off, you really won’t stay asleep for any longer than two hours. 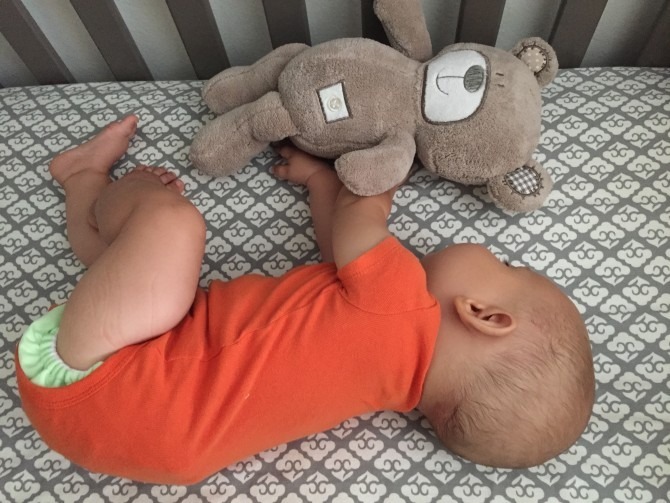 I’m sure your teething is partly to blame, but it doesn’t help that we’ve had to transition you out of your bassinet and swaddle—those were your sleep cues, and they worked well until you became too mobile for them to be safe. 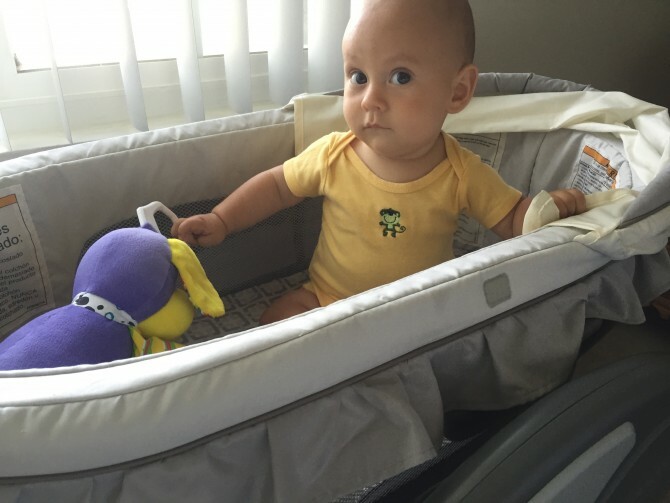 Now you spend the first part of the night in your crib, and you’re not at all happy about it. Our nightly routine goes like this: around 6:30 or 7:00 I get you ready for bed, close the blinds in your room, and put on some soothing white noise. Then we cuddle up with Xavier the Bear (whom we’ve deemed your “sleep buddy”) for some nursing in the rocker. You generally doze off pretty quickly but wake up as soon as I put you in your crib, so then Daddy comes in and bounces you for about twenty minutes (or longer) until you fall into a deep sleep. Sometimes we go through this routine two or three times before you finally go down. . . and then we get to do it all over when you wake up a couple of hours later. It’s pretty exhausting! I bring you into bed with me when it’s my own bedtime, and until recently you would cuddle peacefully with me and nurse throughout the night. But this past week you’ve been awake and active all night long, crawling around our bed and keeping all of us from getting any sleep. It’s hard to get upset, though, because you’re usually in such a good mood. Cuteness aside, I really do hope this Night Owl phase passes! Daytime naps haven’t been faring much better. I’ve read all the books and heard all the advice, but try as I might, I can’t seem to get you on a consistent naptime schedule. Some mornings you’ll take a brief nap mid-morning, but usually you refuse to go down before 11:30. You sleep for 1.5 hours (sometimes longer!) but because that first nap is so late, you bypass the afternoon nap altogether. . . . which means you are VERY grouchy by bedtime. I never knew that sleep could be such a complicated issue! One thing I’m learning is that sometimes I have to let you whine and fuss a bit before settling into a nap; it’s been hard for me to let you cry, and most of the time it only leads to more tears and no sleep, but when it does work, it can be magical. Your happiest moods are always preceded by a nice, long nap! Our biggest adventure this month has been the introduction of solid foods. 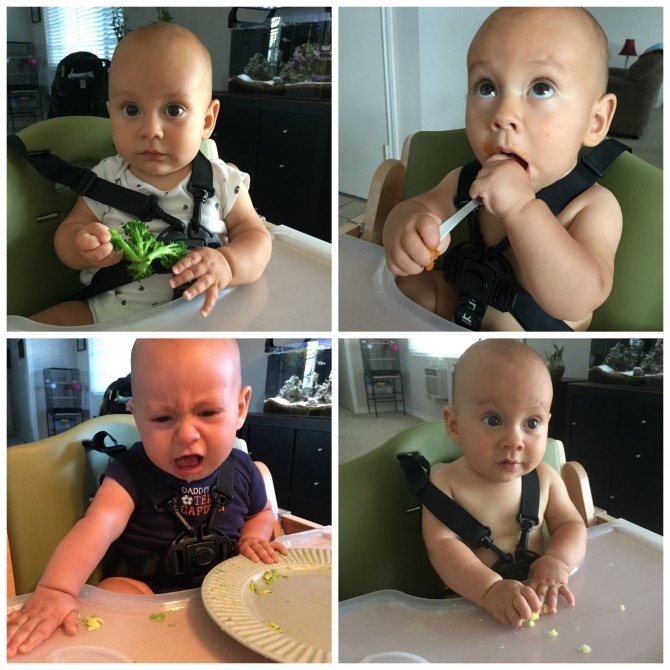 We started with avocado, and while you enjoyed smearing it all over your high chair tray, you didn’t want to put it in your mouth, and once we helped you out with that, you didn’t care for the taste. We’ve since tried several other vegetables, including sweet potato, broccoli, and zucchini—none of which have been big hits. (Though we’ve gotten some hilarious facial expressions out of the process!) The one food you seem to be warming up to is canned pumpkin, which you love to feed to yourself with a spoon. I’ve been pretty impressed with your aim! You also enjoy gnawing on big spears of cucumber, which probably feels pretty good on your gums. I’m glad that you at least seem to like the process of eating, even if you don’t love food itself; I’m sure that will come (probably when we start adding some sweeter foods like fruit to the menu!). In the meantime, breastmilk continues to be your primary food source. I’m so glad that we’ve been able to make it this far with our breastfeeding. You love your mama’s milk, and our nursing sessions are great bonding experiences, now more than ever. It melts my heart when you look up at me and smile as you nurse, and I think it’s pretty adorable the way you lift my shirt when you want to eat, or how you hold onto my breast like it’s a comfort item (even though that clenching really hurts when your nails get too long!). I know I say this all the time, but it’s a message that bears repeating: I love you SO MUCH, Charleston Michael, and am grateful to have you as my son. Life with you is amazing and challenging, exhausting but rewarding. I know I make about a million mommy mistakes each day, but thanks for being patient with me as I figure out this parenting thing. We make a pretty great team, you and I: I can’t wait to see what sort of adventures lie ahead for us! 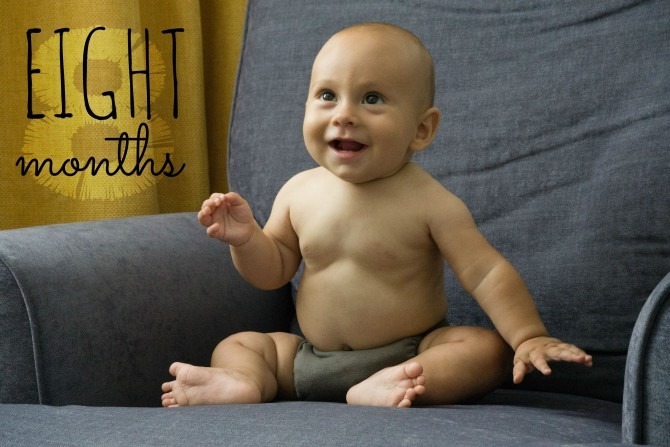 Clothes: You still fit into most of your 3-month clothing but it’s starting to get snug; probably time for Mom to bring out the bigger clothes! Eye Color: Mostly brown, though sometimes they still have a grayish-green hue to them. They continue to be your best feature! Likes: Swinging in your swing; playing with pillows, balls, and plastic rings; reading chewing on board books; feeding yourself with a spoon; sucking on cold cucumbers; helping me sort laundry; drinking water through a straw; playing in the bath tub and the pool; watching (and trying to catch) Sunnybird; looking at anything that’s on a screen; snuggling in bed with Mom and Dad; looking at yourself in a mirror; going for walks in the wrap or stroller. Dislikes: Teething (Mom and Dad don’t like it any more than you do! ); sleeping; being alone in your crib; dogs that jump and bark; riding in the seat of a grocery cart; having your picture taken. 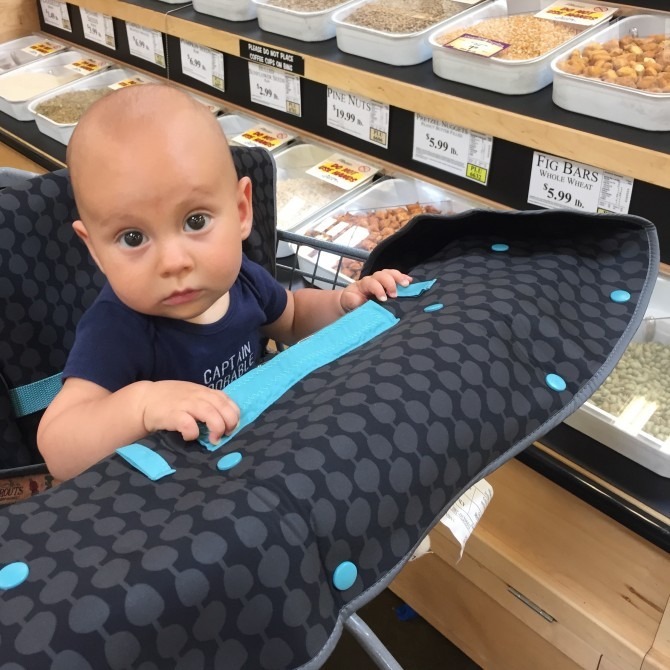 Milestones: Sitting up independently; cutting your first teeth; starting solid foods; sitting in a high chair (at home and at restaurants); riding in the front seat of a grocery cart; transitioning out of the bassinet and the swaddle; first evening home with a babysitter.